Before even coming close to the actual entrance of the temple, you're greeted by a giant wall and a smiling Buddha head. It reminded me of Olmec from Legends of the Hidden Temple (I made sure to keep an eye out for temple guards). Upon arrival you get the impression that you are entering the temple itself. Once walking through the gateway, you travel quite a distance, seeing smaller ruins before approaching the actual temple. The temple was actually a number of temples which all served various purposes. I found it rather interesting that to enter the temples your legs and your shoulders must be covered, but a low cut top is perfectly fine. 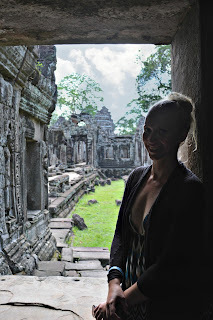 I realise that my choice of lightweight dress might not have been the best when seeing the temples but I was in such a rush I did not want to change. Walking through each area, I couldn’t help but be completely overwhelmed by the intricacy of the carvings. Each of the temples were intricately connected via pathways. There were visible courtyards that would appear in between the corridors of each temple. While some of the temple had started to undergo renovations, most had not. It was incredible to walk amongst the ruins trying to envision what it looked like in its glory days. Every step I took was met with something new. I was constantly wondering how in the heck was this all possible. Here are temples that have survived for almost 1,000 years and buildings now a days crumble quickly when abandoned. The architectural design was exquisite, showing how strong these buildings are. Could it be alien technology? I knew that if I was this amazed by one temple the rest of my trip in Angkor was going to be life altering. We could have spent a longer period of time at Banteay Kadei. But not wanting to miss a thing, we quickly headed to the the next temple... Ta Phrom. 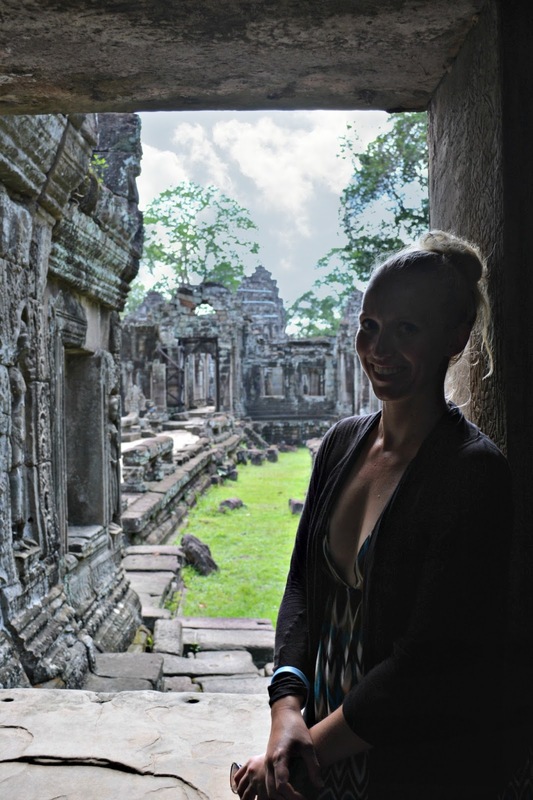 If you've ever traveled to the Angkor Temples (specifically Banteay Kdei), what were your impressions? Share your stories below! We missed going to this temple. I am still wondering how they could even do the blocks assembly - half design on one block remaining on the other how can you even remember what the top or the bottom looked like! The guide told us the temples took 100s of years to be built. Elephants n marvellous engineering technology were used to move the rocks from one place to another. Beautifully written !